Large numbers of templates for DNA sequencing can be produced via PCR directly from plaques, colonies or genomic DNA. Sequencing directly from PCR products has many advantages over subcloning; the ability to PCR directly from plaques or colonies removes the need for template preparation and is highly amenable to automation. The main problem with this approach is the subsequent purification of the amplified products prior to DNA sequencing, especially since the sequence quality is proportional to the purity of the template. This is especially important when sequencing PCR products to identify sequence polymorphisms. We introduce here a general method for producing quality DNA sequencing template from PCR products. This procedure is rapid and inexpensive ($0.15 per prep.). The method termed SPRI (solid-phase reversible immobilization) avoids organic extraction, filtration and centrifugation steps (5). The SPRI method employs a carboxyl coated magnetic particle manufactured by PerSeptive Diagnostics, Cambridge, MA. (cat no #8-4125 *). We discovered that these particles could reversibly bind DNA in the presence of polyethylene glycol (PEG) and salt. This solid phase has no streptavidin, making the use of biotinylated primers or probes attached to the particles unnecessary. When using biotinylated primers one must exercise caution since excess primer will compete for streptavidin particle binding (6). This in turn may also contribute to lower yield and quality of the template. Here we describe a general PCR isolation procedure which is amenable to automation, rapid and yields double-stranded PCR product suitable for DNA sequencing. The method is as follows. Solid-phase reversible immobilization for the purification of PCR products (96-well format). Wash 10 mg/ml carboxyl coated magnetic particles three times with WASH BUFFER [0.5 M EDTA (pH 8.0)]. For each PCR reaction (50 pul), add 10 pl of washed particles and 50 pl of HYB BUFFER (2.5 M NaCl/20% PEG 8000). Mix well and incubate at room temperature for 10 min. Place the microtitre plate on a magnet for 2 min and wash the particles twice with 150 p1 of 70% EtOH. Air dry for 2 min, and resuspend the particles in 20 pl of ELUTION BUFFER [ 10 mM Tris-acetate (pH 7.8)] and incubate at room temperature for S min. Magnetically separate the particles and remove the supematant for testing and sequencing. Figure 1. 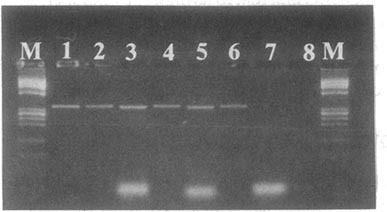 This gel shows an example of PCR products before and after purification using SPRI. Lanes M are 200 ng OX 174 HaeIII digest, lanes I and 2 are one-tenth of a PCR product before and after SPRI purification, lanes 3 and 4 are one tenth of a PCR product spiked with 100 nmol of excess primer (36 nt) prior to purification, lane 3 is before and lane 4 is after SPRI. Lanes 5 and 6 are identical to lanes 3 and 4 using a different PCR product. Lanes 7 and 8 are 100 nmol excess primer (36 nt) before and after purification using SPRI. The SPRI PCR method binds DNA based upon size as shown in Figure 1. This figure shows that for a 2 kb PCR product, the final yield is 80-90% whereas the yield from a PCR primer <50 nt in length is almost undetectable. We have shown previously that the lower limit at which yields in excess of 80% are achieved is 200 bp, the maximum limit is in excess of 200 kb (BAC DNA isolation). Figure 2. Sequencing traces derived from three related individuals are aligned to show the reliability of calling heterozygous bases. The cycle sequencing reactions of purified double-stranded SPRI purified PCR products were performed using AmpliTaq ES DNA polymerase (Applied Biosystems Division of Perkin Elmer, CA) using dye-labeled -21 Ml 3 primers. The reactions were then run on an ABI 373A following the manufacturers protocols. Overall this solid-phase procedure is fast, simple and highly automatable. Over the past year, this method has been used to isolate >5000 PCR products for DNA sequencing, the majority of which have been purified on our robotic systems. 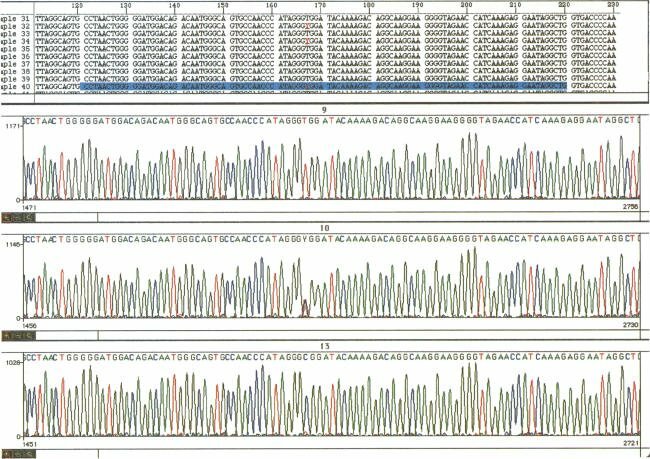 As shown in Figure 2, the sequence data is of the highest quality, allowing the identification of single base pair polymorphisms. Uhlen,M. (1989) Nature 340, 733-744. Hultman,T., Stahl,S., Hornes,E. and Uhlen,M. (1989) Nucleic Acids Res. 17, 4937-4946. Hawkins,T.L (1992) J. DNA Seq. Mapping 3, 65-69. Hawkins,T.L. (1994) In Craig Venter J. (ed.) Automated DNA sequencing and analysis. Hawkins,T.L., O’Connor-Morin,T., Roy,A. and Santillan,C. (1994) Nucleic Acids Res. 22, 4543-4544. Sibson, D.R. (1994) In Craig Venter J. (ed.) Automated DNA sequencing and analysis. *Note: PerSeptive Diagnostics doesn’t seem to be in operation any more. We cordially invite you to try our state-of-the-art MagVigen™ DNA Size Selection Kits for your purification needs.